A prominent American scholar who teaches international relations at George Washington University has publicly proposed that Israel "flatten Beirut" — a city with around 1 million people — in order to destroy the missiles of Lebanon-based militant group Hezbollah. Professor Amitai Etzioni — who has taught at a variety of prestigious U.S. universities, including Columbia, Harvard and Berkeley, and who served as a senior advisor in President Jimmy Carter's administration — made this proposal in an op-ed in Haaretz, the leading English-language Israeli newspaper, known as "The New York Times of Israel." Haaretz represents the liberal wing of Israel's increasingly far-right politics. Etzioni's op-ed was first published on Feb. 15 with the headline "Can Israel Obliterate Hezbollah's Growing Missile Threat Without Massive Civilian Casualties?" (the answer he suggests in response to this question is "likely no"). 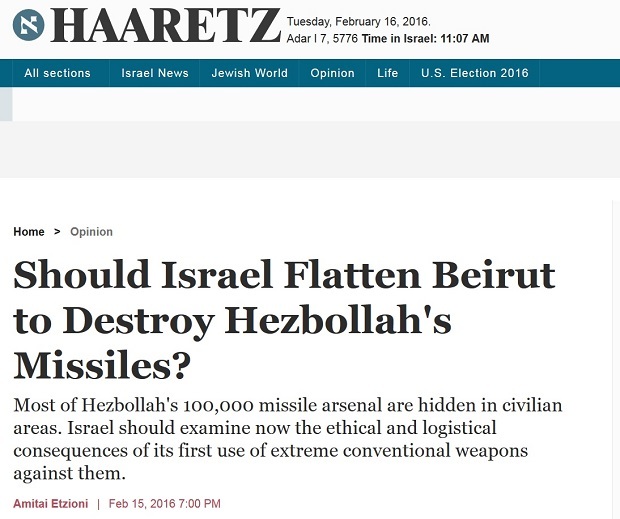 "Should Israel Flatten Beirut to Destroy Hezbollah's Missiles?" was the next, much more blunt title, chosen sometime on or before Feb. 16. As of Feb. 18, the headline is "Should Israel Consider Using Devastating Weapons Against Hezbollah Missiles?" Etzioni served in the Haganah — the army that formed Israel after violently expelling three-quarters of the indigenous Palestinian population — from 1946 to 1948, and then served in the Israeli military from 1948 to 1950. He mentions his military service in both the article and his bio. In the piece, Etzioni cites an anonymous Israeli official who estimates that Hezbollah has 100,000 missiles in Lebanon. In January, the U.S. government put that figure at 80,000 rockets. The anonymous official also says the Israeli government considers these weapons to be its second greatest security threat — after Iran. Etzioni furthermore cites Israel's chief of staff, who claims that most of Hezbollah's missiles are in private homes. Whether this allegation is true is questionable. Israel frequently accuses militant groups of hiding weapons in civilian areas in order to justify its attacks. On numerous occasions, it has been proven that there were no weapons in the civilian areas Israel bombed in Gaza. Assuming it is true, the American scholar argues, if Israeli soldiers were to try to take the missiles out of these homes one at a time, it "would very likely result in many Israeli casualties." In order to avoid Israeli casualties, Etzioni writes: "I asked two American military officers what other options Israel has. They both pointed to Fuel-Air Explosives (FAE). These are bombs that disperse an aerosol cloud of fuel which is ignited by a detonator, producing massive explosions. The resulting rapidly expanding wave flattens all buildings within a considerable range." "Such weapons obviously would be used only after the population was given a chance to evacuate the area. Still, as we saw in Gaza, there are going to be civilian casualties," Etzioni adds. "The time to raise this issue is long before Israel may be forced to use FAEs." Etzioni concludes his piece implying Israel has no other option but to bomb the city of Beirut. "In this way, one hopes, that there be a greater understanding, if not outright acceptance, of the use of these powerful weapons, given that nothing else will do," he writes. Lebanese journalists and activists have expressed outrage at the article. Kareem Chehayeb, a Lebanese journalist and founder and editor of the website Beirut Syndrome, said in response to the piece "Should Israel kill me, my family, and over a million other people to destroy Hezbollah's missiles? How about that for a headline?" Chehayeb told Salon Etzioni's argument is "absolutely absurd" and reeks of hypocrisy. "If some writer said the only way to solve the Israeli-Palestinian conflict is just to bomb Israel," he said, "people would go up in arms about it." He called it "ludicrous" that a prominent American professor "can just calmly say the solution is to flatten this entire city of 1 million people." "I'm just speechless. It sounds ISIS-like, just eradicating an entire community of people," Chehayeb added. Salon called Etzioni's office at George Washington University's Institute for Communitarian Policy Studies several times with a request for comment, but no one answered. After this article was published, Etzioni emailed Salon a statement. "I agree with you that any suggestion to bomb or 'flatten' Beirut (or any other city) would be beyond horrible and outrageous," he said. He said Haaretz had changed and then later corrected his headline. "Ethics aside — Beirut is not where the missiles are housed," Etzioni added. "The issue though stands how is a nation to respond if another nation or non-state actor rains thousands of missiles on its civilian population?" Salon also reached out to the university. Jason Shevrin, a spokesperson, told Salon "the George Washington University is committed to academic freedom and encourages efforts to foster an environment welcoming to many different viewpoints. Dr. Etzioni is a faculty member who is expressing his personal views." The spokesperson did not comment any further. Etzioni is by no means an unknown scholar. He notes on his George Washington University faculty page that, in 2001, he was among the 100 most-cited American intellectuals. He has also served as the president of the American Sociological Association. Writer Belén Fernández, an author and contributing editor at Jacobin magazine, published a piece in TeleSur responding to Etzioini's op-ed, titled "No, Israel Should Not Flatten Beirut." Fernández points out "that Israel has already flattened large sections of Lebanon, in Beirut and beyond." She recalls visiting a young man in a south Lebanon village near the Israeli border who "described the pain in 2006 of encountering detached heads and other body parts belonging to former neighbors, blasted apart by bombs or crushed in collapsed homes." Israel killed approximately 1,200 people and wounded 4,400 more in its 2006 war in Lebanon, "the overwhelming majority of them civilians" according to leading human rights group Amnesty International's 2007 report. One-third of the Lebanese civilians killed by Israel were children. On the other side, 43 civilians were killed in Israel in Hezbollah attacks. One million people were displaced in Lebanon in the war — one-quarter of its population at the time. Tens of thousands of homes were destroyed, and Amnesty reported that "much of Lebanon's civilian infrastructure was damaged or destroyed," including Beirut's airport, seaports, major roads, bridges, factories and more. Roughly 50 schools were destroyed and up to 300 were damaged. Amnesty furthermore noted that up to one million cluster bomblets dropped by Israel remained in south Lebanon after the war, "posing a continuing risk to civilians." In just one year after the war, hundreds of people in Lebanon were killed and wounded by Israeli bomblets and laid mines. Israeli authorities did not provide maps of the areas they targeted with cluster bombs, making it much more difficult for Lebanese authorities to clear up the remnants. Critics argue that Hezbollah rarely initiates attacks, but rather instead responds to Israeli military attacks and assassinations of its leaders. Israel claimed its invasion of Lebanon was retaliatory, initiated when Hezbollah kidnapped two Israeli soldiers in July 2006, but former Israeli Prime Minister Ehud Olmert admitted that Israel had in fact planned the war several months in advance, and used the kidnappings as an excuse. Olmert told the Winograd Commission investigating the government's actions that he had proposed the war in January and had the military draft plans in March. Similarly, despite the Israeli government's many claims that it tried to reduce civilian casualties in its 2008-2009, 2012 and 2014 wars on Gaza, numerous investigations by the U.N., human rights organizations — including Human Rights Watch and Amnesty International — and journalists found that Israel deliberately targeted civilians and used banned weapons like white phosphorous. Reporting on Israel's summer 2014 war in Gaza, Amnesty International said "There is consequently strong evidence that many such attacks in Rafah between 1 and 4 August were serious violations of international humanitarian law and constituted grave breaches of the Fourth Geneva Convention or other war crimes." The Israeli military has previously massacred civilians in Lebanon. With the support of the U.S., Israel invaded Lebanon in 1982. It subsequently waged a war in alliance with far-right, Phalangist Christian militias. In September 1982, Israeli-backed Phalangist militias massacred thousands of civilians in Beirut's Sabra and Shatila refugee camps. Reflecting on the anniversary of the Sabra and Shatila Massacre in an interview on Democracy Now, renowned scholar Noam Chomsky called it "a horrifying massacre, actually one that should resonate with people who are familiar with Jewish history." Chomsky notes that "it was almost a replica of the Kishinev massacre in pre-First World War Russia," a pogrom the Czar carried out against the Jewish population. "This was a kind of a replica, except far more brutal and vicious," he added, noting Israeli Prime Minister Ariel "Sharon escaped more than a mild censure." Chomsky referred to the Phalangists as a "Lebanese Christian terrorist force, allied with Israel." Columbia University professor Rashid Khalidi furthermore pointed out that documents in the Israel State Archives "pin direct responsibility for much more of what happened in Sabra and Shatila on not only Ariel Sharon and the Israeli government, but reveal American responsibility for what happened." "The Israeli government knew perfectly well what was going on," Khalidi explained, and "the Israelis stonewalled to prevent the massacre being stopped." Ellen Siegel, a Jewish-American nurse who worked at a hospital at the Sabra camp at the time of the massacre, told Democracy Now the Israeli-allied Phalangists massacred Lebanese residents and Palestinian refugees who weren't Christian. The Phalangists lined Siegel and her co-workers up on a wall, preparing to execute them en masse with a firing squad, until an Israeli soldier suddenly intervened. "I suppose the idea of gunning down foreign health workers was something that was not very appealing to the Israelis," Siegel remarked. "But the fact that they could see this and stop it shows that there was some communication." After the 1982 war, Israel illegally occupied southern Lebanon until 2000. Israel continues to illegally occupy the Palestinian West Bank and Syrian Golan Heights, which it annexed in 1967. Today, it also continues to occupy Shebaa Farms, an area at the Lebanon-Syria border and the Golan Heights, and impose a siege on Gaza, which U.N. experts say is illegal, maintaining effective control over the strip. Chehayeb says he has seen other friends and acquaintances in Beirut "expressing outrage" at the op-ed. "It's obnoxious how we are all being painted as problematic people that should just be exterminated in the middle of Beirut," Chehayeb said. He noted that, although the U.S. and Israeli media frequently depict Beirut as a "Hezbollah bastion," there are a lot of conflicting feelings about Hezbollah and political differences in Lebanon — just as there are in any country. "A lot of people who are annoyed by Israel's bombing of Lebanon in 2006 never said we should just flatten Tel Aviv," Chehayeb added. The journalist admitted "It's scary to hear this kind of rhetoric... and the fact that it's coming out of Haaretz, which is Israel's most liberal newspaper."